A-Temp Heating and Airconditioning provides a complete heating and air conditioning service so that you never need to go anywhere else for your heating and air conditioning requirements. Our commitment to our customers has been the cornerstone of our continued success over the last 30 years. From the initial measure and quote, through to the installation and service, you will find our staff professional and friendly. When you require a free quotation, you may choose to forward your plans via post/email/fax or otherwise have one of our qualified staff visit the property and evaluate and provide you with our recommendations on the best system to suit your needs and budget. After all, a system that is suitable for one property may not be the best for another. We sell a comprehensive range of well known quality brands of heating and airconditioning products suitable for domestic or light commercial applications. Whatever your situation we have a system for you. Our experienced and friendly technicians offer a complete installation service. 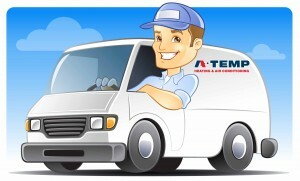 We endeavor to provide an efficient and clean service with minimal disruption to your environment. A Temp Heating and Airconditioning also has a reliable after sales team who will take care of any necessary repairs, servicing and maintenance for your heating or cooling. We can assist you with long-term care tips and any operational difficulties you may encounter with your new system.